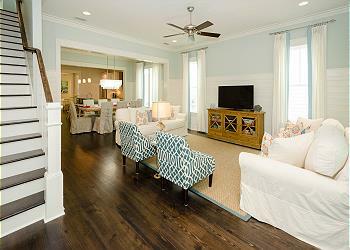 DETAILS: Located in the Crossings II, this coastal beach home boasts beautiful, yet comfortable coastal décor. From the moment you walk inside, you will be enthralled by the beauty of this home. The main living area of the home has a comfortable living room with plenty of seating as well as a large flat screen television for entertainment. Access to the front porch is just off of the living area and offers a beautifully furnished outdoor space in the comfort of a screened-in porch perfect for morning coffee. The gourmet kitchen is also just off of the living room and offers gorgeous blue cabinetry complimented with the gorgeous granite countertops. All of the appliances in the home are state-of-the-art stainless steel and offer all of the amenities of home. The dining area just between the living room and kitchen has seating for six as well as additional seating at the kitchen island. Also located on the first floor is a king bedroom. The amazing colors and textures found in this room give it a luxurious feel. With a king bed and a private bath with a single vanity and walk-in shower, you have a perfect private oasis separate from all of the other bedrooms. On the second level you will find another living area, perfect for the kids. Outfitted with a large flat screen television and sitting area, this space offers plenty of seating and space to play or relax. The second floor also has a queen sleeper sofa for extra guests. Just down the hall, the queen bedroom offers elegant sleeping arrangements with its gorgeous bed and bathroom that features a double vanity and walk-in shower. The third bedroom features two twin beds and an attached bath with a single vanity and a shower/tub combo.The master suite is located on the second floor as well and offers impeccable accommodations. It features a king size bed, a flat screen television, a private bath with double vanity and shower, and access to a private porch that is perfect for relaxation with its seating area and beautiful porch swing. 29 Wisteria Way is a beautiful home. We had 3 adult couples and everyone had their own room with private bathroom. The master suite had a beautiful swing on the porch. The house is wired for surround sound which was awesome. We enjoyed listening to music throughout the entire house and porches. The beds were so comfortable and the linens seemed brand new. Wonderful vacation! We are so happy to hear how wonderful your vacation was! 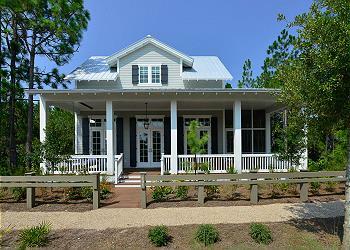 We certainly agree that this home is a great choice for a fun and relaxing vacation. We hope to have you back in the Watercolor area again very soon! Great house! Everything was perfect. Comfy and super cute. Thank you for choosing 360 Blue for your beach getaway. We are so happy your enjoyed your stay in this amazing home! We loved having you with us and hope to see you back soon!